WordPress is definitely one of the most widespread CMSs. However, it's pretty slow in default configuration, especially, if the site has a lot of visitors and heavy content. Moreover, since 2010 Google has used page load times as a factor in its search ranking algorithms. NOTE: Before proceeding with any changes, make sure that you generate a full backup of your website. If you've created your site using Softaculous script installer, feel free to refer to this guide as well (step #4 – Backup software). The main and the most important rule about choosing a theme for WordPress website is that WordPress theme should correspond to the content of your website. You should define the topic of your website and the content it should be filled with first, and only then choose a theme which will suit for your future website. Many WordPress themes are flexibly customizable and allow WordPress users to tweak multiple theme options to create the desired look for their website. These options, if they are coded improperly, can create issues with changing theme to another one. 1. The simpler – the better. 2. Choose a theme with responsive layout. 3. Take into account the range of supported plugins. 5. Consider SEO friendliness of the theme. A number of plugins for reducing image size exists on the web, for example, EWWW Image Optimizer, WP Smush.it and so on. They all have different features and allow you to find the configuration you need. 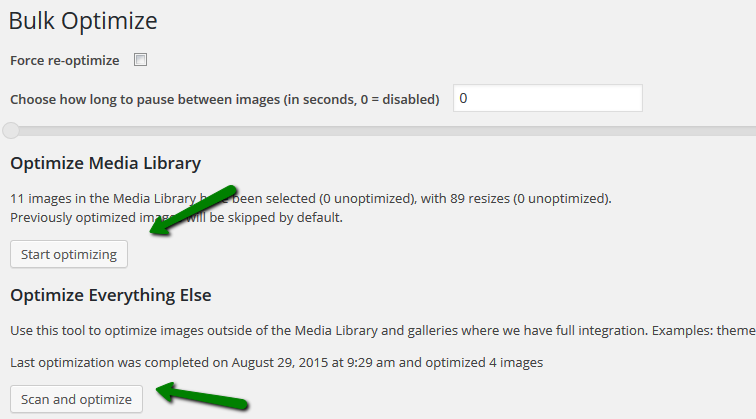 We recommend using the EWWW Image Optimizer plugin. NOTE: It requires exec() function, follow the instructions here to get it activated. cPanel includes Optimize Website function. It uses Apache's mod_deflate to compress content before sending it to the visitor's browser. Gzip is the most popular and effective compression method today. If gzip compression is enabled for website content, it generally reduces the response size by about 70%. To gzip your website components, log in to your cPanel > go to Software and Services section > Optimize website menu. If you wish to get familiar with all configuration options of WordPress 3 Total Cache plugin, you may find them listed in this article. 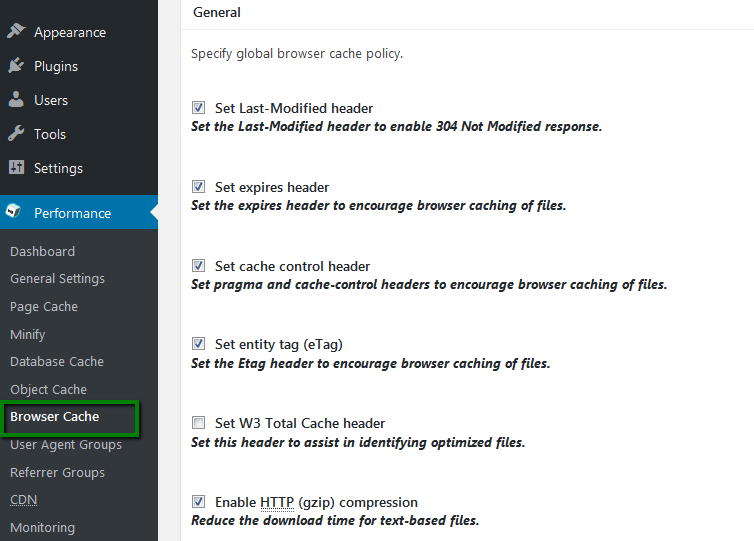 If you do not have W3 Total Cache installed on your website, you can enable browser cache with the help of Browser Caching with .htaccess plugin. The first thing people see on the website is the homepage. It is very important to pay attention to its proper optimization. The less HTTP requests are performed by the browser to load your website content, the faster your pages load for the visitors. It is the Golden optimization rule. It means that the media content of the page, WordPress theme and plugins should be fetched by visitors’ browser using as fewer requests as possible. WP Asset Clean Up plugin for WordPress can help you with reducing the number of HTTP requests for your website making your website pages load smoothly and quickly. WP Asset Clean Up plugin prevent unnecessary styles and scripts from loading on your pages and makes them. It makes the assets load on the pages where they are actually required without overloading the other pages, it also reduces the HTML code of the actual page. Once done, re-test your site. If everything is done properly, the only blocking CSS/JS file left should be your combined CSS file, and nothing else. Optimizing the database may also be useful for a WordPress blog. Currently WordPress has 11 core tables. Most WordPress websites have even more tables because plugins save settings and other data in the WordPress database. Themes may also save settings and other data stored in WordPress database. WP-Sweep is that it uses proper WordPress delete functions as much as possible instead of running direct delete MySQL queries. Whereas WP-Optimize plugin uses direct delete SQL queries which can leave orphaned data left behind. We would also like to remind you to back up the database before making any major adjustments especially to third-party plugins. When a lot of plugins are installed on your website, they allow you to enrich your WordPress website functionality and include a variety of custom options for you and your website visitors. The side-effect is that heavy and resource-capacious plugins may slow down your website by consuming the CPU and I/O resources allotted for your website. To optimize your website efficiently, you should understand which exactly plugin is eating up most of the resources. To check it, you may use P3 (Plugin Performance Profiler) plugin for WordPress. When scanning your website with this plugin, it shows a diagram with the contribution of each plugin to the website loading time and the relative time each plugin loads. It will allow you to determine which plugins make your website load slower and decide whether they can be disabled. There is another useful plugin for WordPress – Plugin Organizer. It allows you to disable plugins selectively and rearrange the order your plugins are loaded in. It can also improve your website performance. Finally, once all these measures are implemented, you may check the optimization level of your WordPress website with GTmetrix plugin for WordPress and enjoy the scores you earned!